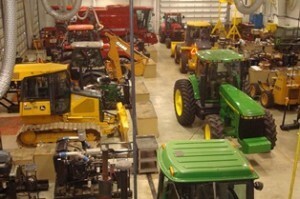 The Diesel Powered Equipment Technology (DPET) program is a two-year program that trains students to service, repair, and diagnose diesel powered equipment like agricultural machinery, tractors, on-highway trucks, bulldozers, road graders, combines, loaders, and more. This program combines classroom learning with hands-on experience. The lab is equipped with the latest electronic test equipment to help students diagnose problems. Students work with electronic diagnostic tools, bore gauges, flow meters, calipers, dial indicators, laptop computers, engine dynamometers, digital multimeters, micrometers, pressure analyzers, power wrenches, hand tools, and other specialized equipment. Students complete two paid internships during their sophomore year at a dealership that services diesel powered equipment. Upon completion of this program, you’ll be ready to enter the workforce or continue your education by transferring to a four-year college or university. This program is a competitive program. We encourage students to apply by the first application deadline of December 1 to be considered for the following fall semester. A second application deadline of April 1 will allow students to be considered for fall if the program still has openings. Any applications received after April 1 will only be considered if the program is not full. Call (309) 694-5582 or (309) 694-5616 to request a DPET information booklet. Apply to Illinois Central College. Schedule and take the ICC Placement Tests. Meet with a DPET academic advisor. Contact Jeff Gardner at 309-694-5582 for an appointment. Students complete two, eight-week internships during the sophomore year of training. Technical training reflects the technology represented by the agricultural equipment, construction equipment, and heavy truck industries. The graduate's salary will directly commensurate with the service professional's academic performance, work ethic, and motivation. Graduates have the opportunity to transfer to a four-year university. Students must be enrolled as full-time students and complete the required coursework in the prescribed sequence. Students must provide their own tools for use throughout the course of study.